As pet owners, we love to play with our pets. But when our pet is a Rottweiler puppy, who will end up weighing 75 to 130 pounds, we must teach them from a young age that biting and nipping is not good behavior. I wanted to talk about why your puppy bites and how you can prevent this from carrying over into adulthood. Why Does My Rottweiler Puppy Bite Me? Rottweiler puppies are very energetic and strong. Even when they are very young. 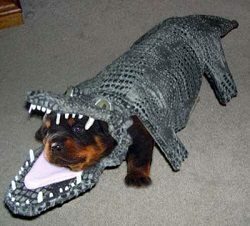 Your Rottweiler is probably biting you because they want to play. Puppies get bored and need an outlet. You need to make sure you have lots of toys for them to play with. And even more important, lots of things for them to chew up and gnaw on. Your Rottweiler puppy may also be biting as a result of aggressive or dominant behavior. This must be halted or you will have a large aggressive Rottweiler on your hands in a few months that does not respect you, and someone could get seriously hurt. Next we will discuss how to curb your Rottweiler puppies biting issues. All puppies bite each other when they are playing. Observing puppies play can actually teach you how to curb biting problems with your puppy. You will see that when two Rottie puppies are playing, they will tumble around and bite each other. When one of the puppies bites too hard, the other one will let out a high pitched yelp. When this happens, the aggressor who got too rough will stop and the other puppy may end the playing session. You may see that they are back at it in no time, and you may hear a yelp again. The puppies are predispositioned to understand that they are hurting their buddy, and if they are gentler with their friend, they can continue playing. When playing with your puppy, allow your puppy to only gnaw gently on your hand. When they bite too hard and hurt you, imitate a yelp like a puppy would. Make sure it is high pitched and that you do so immediately. Also, if you can, let your hand go limp in the puppy’s mouth, giving them the opportunity to become gentler. Also, pulling away suddenly can cause the puppy to latch on tight and you could get seriously injured. Don’t be afraid to tell the puppy “NO” when they are too rough. 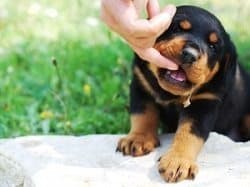 Continue to play with your Rottweiler puppy, allowing them to bite gently on your hand. When they are too rough, yelp. If they do not loosen their grip on you, stop the game and walk away. But remember to come right back and try again after about 15 to 20 seconds. Do this for about 15 minutes, and if the puppy has been gentle with you for the entire 15 minutes, make sure you reward them for good behavior. If they do not continue to be gentle, end the game and try again later. Also, when playing with your Rottweiler puppy, always discourage aggressive behavior. I like to keep a chew toy handy when playing with a puppy. This way, if they are biting too hard, I can shove a chew toy into their mouth. This teaches them that they are only allowed to bite their toys like that. If they want to bite your hand, they have to be very gentle. Remember, Rottweiler puppies grow into big Rottweiler dogs. Teaching them to only bite gently when playing should be taught immediately. And biting/nipping should always be discouraged unless they are playing very gently.